Racial slurs have no place in sports culture, and California just made this fact the law. Gov. Jerry Brown signed Assembly Bill 30, the California Racial Mascots Act, in 2015. This month, it comes into effect. 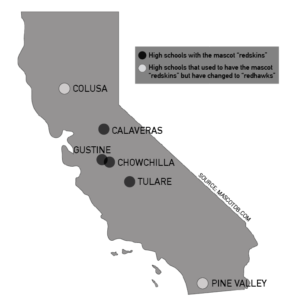 Four schools in California with the mascot name “Redskins” will be affected by this law. However, as of 2013, at least 62 high schools across the nation continue to bear the name without laws stopping them. The California Racial Mascots Act is an important law, and other states should follow suit. While AB 30 is a victory in California, there are still bigger problems to address — the NFL team, the Washington Redskins, retains its name. Team owner, Dan Snyder, vowed to never change its name, citing its 80-year history and franchise loyalty. But this is not justification for using a racial slur referencing Native American genocide and oppression. San Diego State University has also been under fire for its mascot, the Aztec Warrior. While the mascot itself does not have a derogatory background, it perpetuates the idea that using cultural caricatures for the sake of entertainment is acceptable. “There doesn’t have to be a racist intent to produce a racist outcome,” several tribal leaders wrote in a letter to lawmakers regarding the Washington Redskins. The normalization of racism in sports culture needs to be recognized and stopped because it encourages and normalizes this offensive language. According to a study in Psychology Press, use of Native American symbols as mascots leads to stereotyping and a decreased sense of self and community worth among young American Indians. AB 30 allows schools to phase out materials containing the name up until 2019 to alleviate the cost of new uniforms, signs and other materials. To help with the transition, in 2015 Adidas offered to give financial assistance and design resources to any high school that wanted to change its school sports branding away from offensive imagery. With ample support, schools across the country need to be making this change and states need to be taking the steps to prevent them from continuing. We must remember the history behind these names and symbols is one of discrimination, persecution and homicide. Continuing the use of derogatory language promotes the racist ideology these symbols come from. The term “redskin” has always been used as a racial slur and has no place today. The tradition of having a name for 80 years cannot outweigh the concerns of an underrepresented group. We must consider the subtleties of racism and how they show up in our cultural practices. We need to eradicate this bigotry from modern day American sports culture.